An annual sheep race has been cancelled after more than 50,000 people signed a petition calling for it to be banned. The Hoo Farm Easter sheep race had been a bank holiday tradition in Shropshire since 1991. 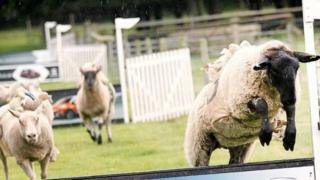 Animal rights group Lambentations said sheep racing was "cruel" and thousands signed a petition against it. Hoo Farm said it was cancelling its Sheep Gold Cup and Sheep Grand National events and said sheep racing was "under review for the foreseeable future". The family-run farm in Telford has held sheep racing on an almost daily basis for 27 years. A statement on its Facebook page said the announcement was being made "after threats to ourselves, our livelihood, our business and our animals". The farm said vets would now be looking at sheep racing to "see if it really does cause an issue". "If it does, we'll happily in a heartbeat never do it again. "If it doesn't and they can prove that, we'll quite happily look at bringing it back," a spokesman added.